As I returned to my post this morning, I was facing another "It's a beautiful day in the Adirondacks!" kind of story. Don't get me wrong. I embrace my moniker as the light-weight, Pollyanna Adirondack blogger who revels in her surroundings, avoids testy discussions and runs a business blog (God forbid!). There are times though, when even I get a little tired of telling you how blessed I feel to live here in the Adirondacks. Imagine my pleasure and surprise then to find today's photo and story about one of my favorite Adirondackers in today's Press Republican. 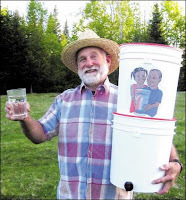 Paul Gutmann, our very own Bill Nye the Science Guy and former operator of the Village of Lake Placid water works, is heading back to the Dominican Republic to continue his volunteer efforts to bring clean water to Gautier, a region of the Dominican Republic. He is asking people who have spare five-gallon plastic buckets to contact him at 523-9077 or by e-mail at gutmannpaul@yahoo.com. People can also bring buckets to the St. Eustace Episcopal Church, 2450 Main St., Lake Placid.The buckets should be easy to clean, he said, such as those that held joint compound, food or driveway salt. It is a plus if the lid is still available, Gutmann said. "We are designating Wednesday, Feb. 18, as official bucket pickup day, but we will accept clean buckets at any time." My family's connection with the Gutmann family goes back 21 years when my son met Turner, Paul and his wife Linda's son, in kindergarten. I could go on and on about my "other son" and his wonderful family, but then I would just be gushing and reveling. I'll leave you to go look for a clean bucket.